First of all I’d like to say I’m flattered Amy asked for me to be a guest blogger! Amy and I went to college together and were sorority sisters. 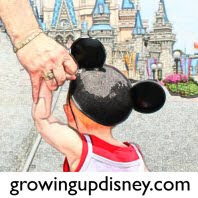 We have been able to reconnect thanks to the internet and her awesome blog, Growing Up Disney, which I’m thankful for! I grew up visiting Walt Disney World. I was raised in South Florida and Disney World wasn’t too far away. We usually went once a year and it was normally through school or church. This is the way I remember going to Disney…wake up early, drive 4 hours to Orlando, spend the day in the Magic Kingdom and then drive back home that evening. Can you say EXHAUSTED?! I would envy those that could stay in Disney hotels and eat at Disney restaurants. The only food I ever ate was fries and maybe a slice of pizza from a quick service restaurant, if I was lucky! My family actually did go to Disney for a weekend and we did stay in a resort ONCE. We camped at Fort Wilderness (in a camper not a cabin) soon after Epcot was built. Not exactly luxury but I do have the fondest memories of that trip over any others from my childhood. I guess that’s why I cringe when I hear about someone going to Disney on a vacation only for a couple of days. I hear people say they’re going to Orlando for a vacation and they’ll go to the Magic Kingdom for one of the days while they are there. I want to scream, “You’re doing it all wrong!” I often hear people complain about how stressful the planning is or how stressful their trip was but it doesn‘t have to be. There is a much easier way! I believe the way to go is to stay at least 5 nights and to do the Magic Your Way with a dining plan. You’re not stressed out trying to cram everything into 1-2 days! There is so much to see and do and it makes it so much more enjoyable when you can take your time and not be in a rush. We’ve actually been for 8 days and we still leave feeling like we haven’t seen it all! I had not been to Walt Disney World since college in 1992. I had my career, met the love of my life, got married, and had a son. 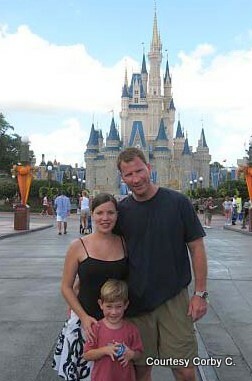 When our son was about to turn 3 in 2007, we started planning our first Disney trip as a family. My husband’s boss at the time was a Disney fanatic. He knew all things Disney and we knew nothing when it came to planning a trip. It is thanks to him that we learned how to plan our trip right and our Disney addiction quickly began! 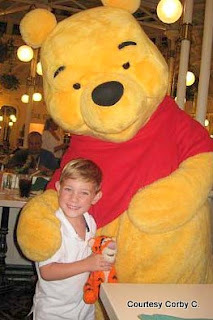 Returning to Disney brought back so many memories, having gone there my entire childhood. Seeing the happiness and joy on my child’s face was absolutely priceless to me! I know this sounds corny but I literally got tears in my eyes the first time we entered through the gates on Main Street! We got a park hopper pass and enjoyed going to all of the parks for 6 days and 5 nights. We stayed on property at Port Orleans French Quarter which we enjoyed. I must admit though, my favorite thing which I wasn’t expecting at all was the dining! It was absolutely fabulous! I had no idea we would wake up eating Mickey waffles, pancakes, eggs, bacon, and biscuits and then in the evening eat filet mignon, seafood, and crème brulee! And all of this was made so convenient with the swipe of one little “Key to the World” card! Little did I know our vacation in September 2007 would spark such a love for Disney in our family! 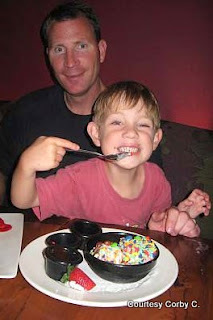 My son will be turning six this year and we’ve just planned his 5th trip (in three years) to Disney this November! He now has a new sister that will be joining us this year for the first time. We’ve decided to start her young, at 6 months! It’s so easy (and dare I say fun) to plan our trips! I simply call (407) W-Disney, book the resort of our choice for the dates we would like and inform them I’d like to do the Magic Your Way plus dining plan. I then make all of my dining reservations online and it’s done! Please note, many restaurants do book up quickly so I recommend making your reservations as close to the 180 day window as possible. And it doesn’t have to be ridiculously expensive. Our trip this year will cost approximately $1600 which includes hotel, food, and park passes for a family of four (well, 3 and a baby) for 5 nights. We will stay on property again at our favorite resort, Port Orleans Riverside, and we will have the dining plan through a Disney promotion for free. I hope this information helps someone while planning their next vacation. Just be warned: you may create your own Disney addiction as well! Great guest post, I hope the following ones will be just as good wink wink nudge nudge! Lol :-) great job! And so nice to reconnect with old friends! Nice post. I know what you mean when people say they are just going to drop by to WDW for a day. GREAT JOB Corby...we actually have very similar thoughts of how to plan and execute a trip to Disney! We are taking the kids for their 9th and 11th birthdays next month and it will be our 5th trip as a family, although we also spent our honeymoon there! We have been using the dining plan since its inception and LOVE it. I always hear people saying, "Everything is so expensive when you go to DisneyWorld" and my reaction is always "You DON"T go to DisneyWorld to save money"! Great post!!! I love Disney as well...although I lived in NY my entire life and didn't get to go to Disney until I was 19 years old. We take frequent trips and always stay at the Wilderness Lodge. So spoiled. We used the Dining plan for the first time last year and loved it. Disney is definitely a tradition we will be keeping in the family! YAY!! !Great Post When will you be there? We are going again Oct 23-28 and staying again at PO Riverside and there during Food and Wine. WE booked with a free dining plan again which was so worth it for the ease of use. We planned out whole trip and meals this week. Baby Ian will be around 6 months too! Great post Corby! We just planned our 6th trip in 4 years for January. Needless to say we are Disney fanatics. We started taking Anna and Jacob going at 4 & 3 but Sarah Quillen started going at 12months and did GREAT. You guys will have such a great trip! P.S. I cry everytime I walk under the Main Street train station and see that castle at the end of Main Street. Great post! Thanks for contributing you're welcome to post anytime.